Colorful and bold, this dish shows how seamlessly Latin and Asian flavors can blend. To make the prep faster, buy precut pineapple. The sambal is quite spicy, and the chiles add to the fire—so seed them if you want to moderate the heat of the dish. The recipe is from Isabel Cruz, chef and owner of Isabel Pearl, in Portland, and Coffee Cup Café and Isabel’s Cantina, both in the San Diego area. Cruz is also the author of The Latin Table: Easy, Flavorful Recipes from Mexico, Puerto Rico, and Beyond (Skyhorse Publishing, 2018). Bring a medium pot of water to a boil, add shrimp, and poach until curled and pink and just barely opaque in center (cut one to check), 2 1/2 to 3 minutes. Drain and pour into a bowl of ice water. When cool, drain again and chop into 1/2-in. dice. Chill until using. Make ginger sambal: Purée sambal ingredients in a blender or food processor (add water as needed to make it pourable), then chill until using. Make vinaigrette: In a small bowl, whisk together lime juice and oil. 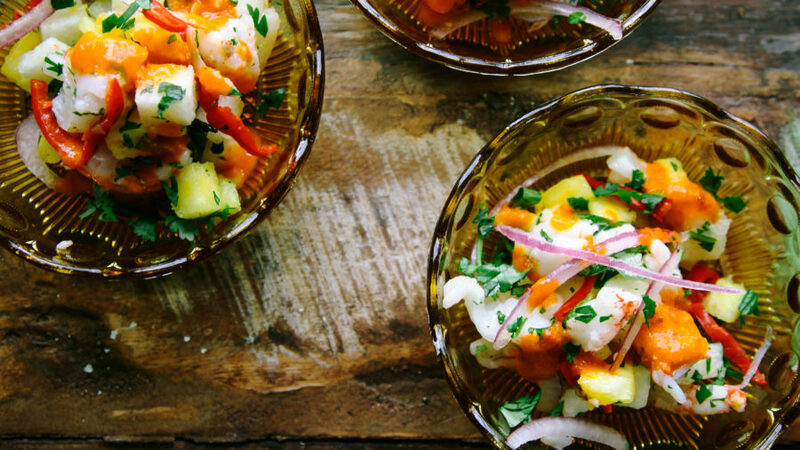 Just before serving, put shrimp, pineapple, jicama, onion, chiles, cilantro, and mint in a large bowl. Toss gently with lime vinaigrette and add salt to taste. Divide shrimp cocktail among 8 to 10 small bowls or glasses and drizzle sparingly with ginger sambal. Serve with extra sambal on the side. *Jicama, a juicy, crunchy, slightly sweet ­tuber, is best when small (bigger ones tend to be dry and starchy). Buy them from a place that has high turnover, like a Mexican market or farmers’ market. Find sambal oelek at well-stocked grocery stores, Asian markets, and online.